Bioenergetics describes how living organisms extract energy from their environment to fuel basic energy-consuming activities, including using adenosine triphosphate (ATP) as a source of chemical energy. Living organisms can provide for their energy needs as autotrophs or heterotrophs. Autotrophs, which include plants and algae, use the highly efficient process of photosynthesis, which converts energy from sunlight to ATP. Heterotrophs, by contrast, ingest and break down complex organic molecules contained in externally obtained nutrients to generate energy. Given the wide diversity of living organisms, you might reasonably expect that many mechanisms evolved to generate energy. Not so. Glucose is broken down by the same chemical pathways in bacteria as it is in higher organisms. All organisms use ATP as an intermediate in energymetabolism. Metabolism refers collectively to chemical reactions that break down complex chemicals to generate energy and make ATP (catabolism), and those chemical reactions that consume energy and ATP to form complex molecules from simpler ones (anabolism). In 1957, Hans Krebs and Hans Kornberg, both German-born English biochemists, authored the 85-page booklet Energy Transformations in Living Matter, the first publication on thermodynamics in living beings that linked biology and biochemistry. There are two laws of thermodynamics (transformations of energy), which were developed over decades during the nineteenth century by many scientists, including William Thomson (Lord Kelvin) in 1848 and Rudolf Clausius in 1850. The first law states that all the energy in the universe is constant and that it cannot be created or destroyed, only converted to other forms of energy. The chemical energy extracted from nutrients is converted into energy used to process food for use in anabolic reactions and to support living processes. The second law states that energy transformations are inefficient because some energy is lost and unavailable to do work. Loss of heat from the body, such as during exercise, would represent such an energy loss. Energy balance is that aspect of bioenergetics that examines the body’s harmony between the intake of energy and its expenditure. SEE ALSO: Metabolism (1614), Photosynthesis (1845), Homeostasis (1854), Enzymes (1878), Mitochondria and Cellular Respiration (1925), Energy Balance (1960). 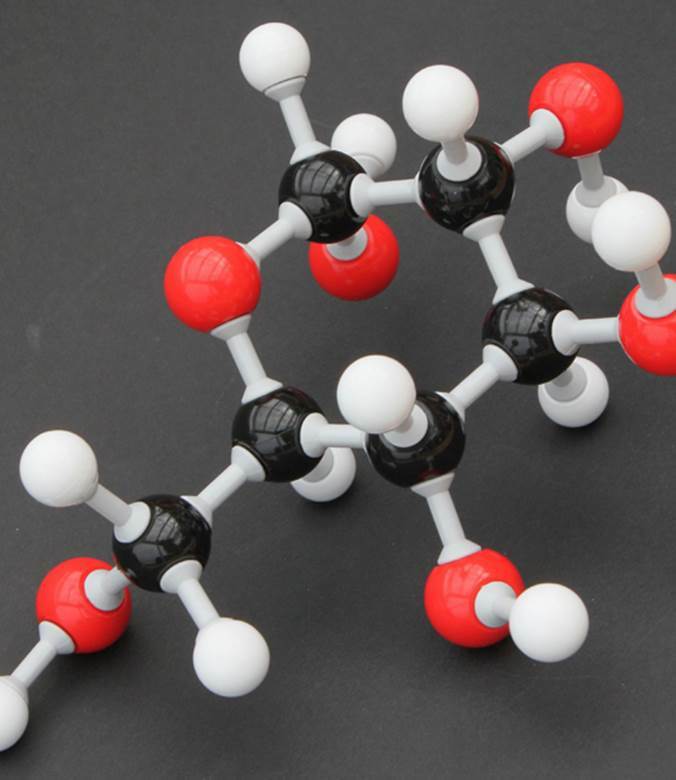 Glucose is a secondary source of energy and an intermediate in ATP production, which is broken down by the same biochemical reactions in humans and bacteria. The ball-and-stick representation of alpha-D-glucopyranose depicts its three-dimensional structure, with white = hydrogen atoms, black = carbon, and red = oxygen.